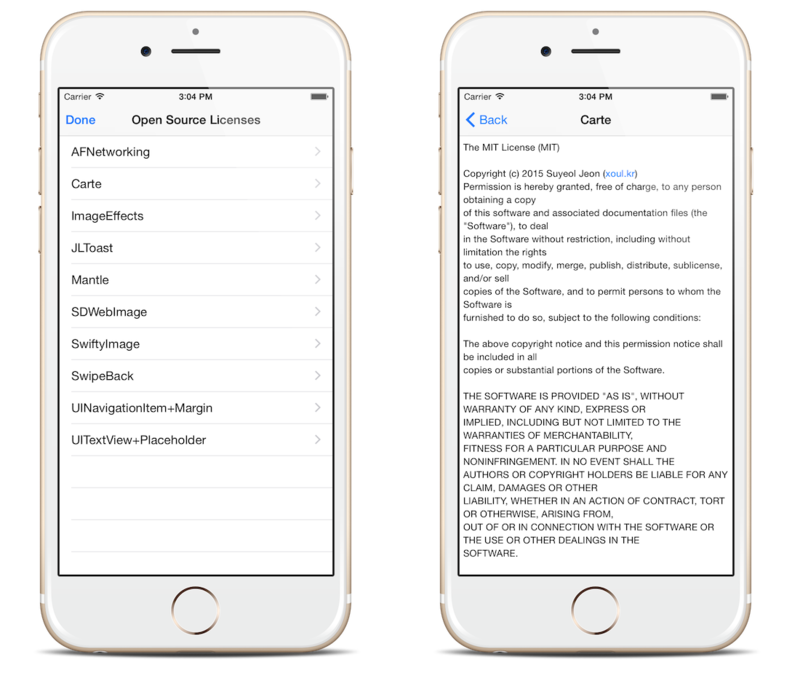 An open source license notice view generator for Swift. 🚗 Automatic: Carte automatically generates OSS notice from CocoaPods. ☕️ Easy Integration: Install Carte and push CarteViewController. It's all done. 🎨 Customizable: Adding custom items, customizing CarteViewController. See Customizing section. Carte only supports CocoaPods at this time. Carte provides CarteViewController. You can use it as a normal view controller. Push, present or do whatever you want. If you want to create your own UI, use Carte.items to get CarteItems. CarteViewController has a property named items which is an array of CarteItem. All of the licenses are stored in the items. You can add new items, remove existings, or sort items by manipulating items array. This is an example of adding a new CarteItem and sorting items. item.licenseText = "The MIT License (MIT) ...Very long text..."
CarteDetailViewController is presented when user selects a table view cell. CarteViewController provides a handler for customizing it. var configureDetailViewController: (CarteDetailViewController -> Void)? Carte is under MIT license. See the LICENSE file for more info.